It creates a precompetitive message for the entire industry to disseminate in its relations with end users. There was a time not too long ago when a drought in New Zealand or rising dairy demand in China or the removal of the European Union’s milk quota system would have barely registered with U.S. dairy farmers and manufacturers. Their main concern, if any, would have been whether any of that meant more dairy imports destined for the United States. Over the past decade or so, the U .S. dairy industry has transformed from an inward-looking business with a decidedly defensive posture into the No. 3 global exporter, investing in people, processes and products specifically for world markets. U.S. dairy manufacturers have begun making the products that overseas customers want—whole milk powder, low-spore powder, cheese for processing, milk protein concentrate, high-spec whey protein concentrate and isolate, UHT milk—instead of merely trying to sell what they make. They are working with end users to understand how they are utilizing dairy products, and then making processing and packaging adjustments to meet their needs. The industry has worked hard to redefine itself as a consistent, customer-centric global business partner. Yet, through all that work, negative myths recalling those times of casual participation in world markets still linger. That’s why in late 2013 the U.S. 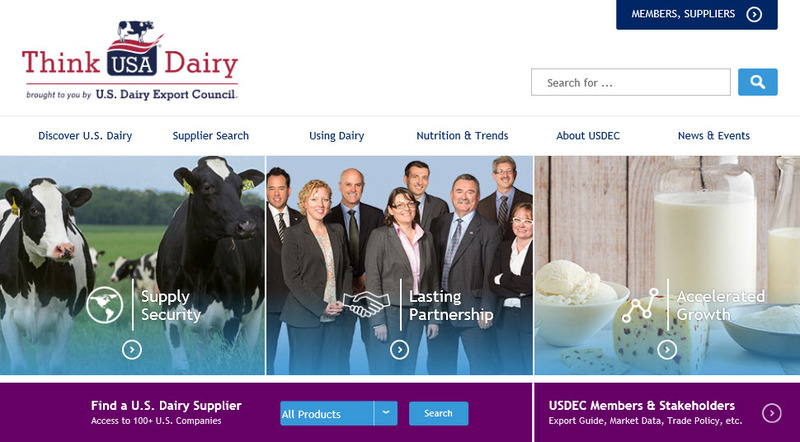 Dairy Export Council (USDEC) began meeting with its global marketing advisory group (representatives from eight U.S. dairy suppliers) to develop a plan to put those misconceptions to rest once and for all. Reinforces how we have evolved as an industry. Showcases our strengths and achievements. Distinguishes U.S. products from those originating elsewhere. Demonstrates decisively that we are the partner of choice. The recently launched ThinkUSAdairy.org website is the cornerstone of the initiative. A new resource for U.S. dairy end users built from the ground up, it focuses on the three pillars of U.S. capabilities: supply security, partnership and growth. Within those is a wealth of information demonstrating U.S. knowledge and expertise on dairy research, dairy’s role in diet and nutrition, and ingredient functionality and applications. It also highlights areas of the U.S. industry that buyers might be unaware of, like sustainability and food safety. The site and a range of materials—signage, imagery, print resources— are utilized during all interactions with customers. This includes trade shows and events like USDEC's U.S. Dairy Business Conference held in Singapore in May. All share consistent imagery, colors and feel. Consistency is the watchword, which is why this is much more than a USDEC marketing initiative. ThinkUSAdairy.org is not a USDEC brand or slogan, but a precompetitive message for the entire industry to disseminate in its relations with end users. We need U.S. suppliers to go out and repeat the same messaging, highlighting U.S. resources, capabilities, quality, commitment, investment in innovation, and other unique elements that the United States brings to the table. Providing a cohesive voice reinforces the U.S. dairy story. If a dozen companies call on an overseas buyer telling the same story of U.S. industry evolution, capabilities and commitment to export markets, that buyer is going to find the message more authentic. It will dispel those last cobwebs of doubt about U.S. intentions and crystallize the notion that this nation’s dairy sector is indeed in it for the long haul. This communication effort is not meant to preempt each individual company’s approach to a customer, but rather complement it. It paves the way for suppliers to then tell their own stories. If we do this correctly together as an industry, consistently articulating our value proposition and telling our story, it will help sustain our long-term success. It shouldn’t really be that hard. U.S. suppliers have concrete examples of investments made in education to learn about expectations in overseas markets, in personnel dedicated to international sales and service, in plant upgrades to manufacture to end user specifications, even in overseas offices. The U.S. industry has made the leap in understanding the globally interconnected nature of today’s dairy market and has committed to being a world supplier. Now we need to own our own image and define our own abilities rather than letting the competition do it for us. The U.S. Dairy Export Council is primarily supported by Dairy Management Inc. through the producer checkoff that builds on collaborative industry partnerships with processors, trading companies and others to build global demand for U.S. dairy products.